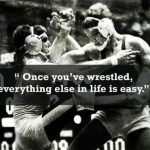 What can I do outside of practice to become a better wrestler if I don’t have a partner? We’ve all asked that question at least once in our wrestling careers. But what’s the answer? How do I train wrestling at home without a partner? Watch instructional videos – It’s not hard to find some really great wrestling videos online. Watch videos from the Olympics. Watch videos from tournaments. Study the videos. Make this your homework to study the moves of the greats. Run – Get that cardio up, son. Anybody who has stepped foot on the maps will tell you that cardio & endurance are vital to wrestling. You can be stronger than your opponent, but if your cardio & endurance are weak then you will struggle in each of your matches. Drill moves on my own. Shadow wrestling is a great way to practice when you don’t have a partner. Envision yourself against your opponent. Circle your opponent, move in and out with your feet, legs and hands, and take shots. Focus on your technique, the quick penetration to get a leg, and work on explosion through shots over and over. Lift weights – Proper strength training is a great way to gain an advantage over an opponent. We always encourage our athletes to find a great personal trainer with a proven track record. Personal trainers will also help you manage your weight so you can be at that peak weight level and not have to go through dangerous weight cuts. Which one you do depends on what you need to improve. I would say you should do a little of each option above. Anything that you can do to give yourself that competitive edge over your wrestling competition is worth doing. Wrestling as a competitive sport has been around for centuries. That makes sense, as wrestling doesn’t require any specialized equipment other than your own body, and you don’t need to organize an entire team of people to participate. All you need to wrestle competitively is a worthy opponent and some knowledge of the basic styles of wrestling. Of course, the more practice you have under your belt, the better off you will be, as well. People have used wrestling to establish dominance through competition at least since ancient Roman times, in the very first Olympics, and most likely even for centuries before that. Through all this time, these basic styles have actually changed very little. This is the most traditional style of wrestling which has been used in competitive arenas throughout the ages. Greco-Roman wrestling involves strictly upper body moves. You are not allowed to do things like sweep your opponent’s legs out from under them; in fact, you are not allowed to even touch their legs. Upper body strength and maneuvers are the keys to victory in a Greco-Roman wrestling match. Spectators enjoy the throws involved with this type of wrestling. This is the type of wrestling which is much more dominant in today’s realm of wrestling as entertainment for the masses. Pretty much anything goes in a freestyle wrestling match. Pins tend to happen quickly in this type of wrestling and the use of and attack on legs-or any part of the body-is allowed. Opponents are typically much more aggressive toward one another in freestyle wrestling than they seem to be in Greco-Roman wrestling. This is actually the style of wrestling people know best in America, as folk style wrestling is the model most followed in high school and college level competitive wrestling. Folk style wrestling is very similar to freestyle wrestling, with a few notable exceptions in rules of play and scoring methods. For example, while both freestyle and folk use a point system in determining a champion, freestyle scoring awards wrestlers anywhere from 2-5 points for different types of throws, while folk scoring only awards points for pins. 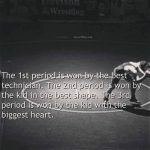 This important difference can greatly influence a wrestler’s strategy in securing a win. From a spectator’s perspective, this can make a significant difference in the sheer entertainment value of any given wrestling match. Wrestling has withstood the test of time as both a competitive sport and a popular entertainment venue for several reasons. First of all, it is a sport that is based not on high-tech equipment giving one opponent an advantage over the other, but on sheer individual strength and skill. Greco-Roman still represents the sport of wrestling in its original form though it has evolved to include variations such as folk style and freestyle…even professional wrestling has its roots in ancient Roman times. Whether you are competing or watching, wrestling has been a part of human civilization since the beginning of history, and it’s a past time that’s likely here to stay. Some synonyms for endurance are determination, fortitude, perseverance, persistence, stamina, staying power, and tenacity. Do you have the fortitude and stamina to keep wrestling hard for an entire six-minute match? Can you go the distance? Conditioning expert Ross Enamait states in Infinite Intensity, “Conditioning is king inside the ring.” For us wrestlers, I may change his quote slightly to say, “Conditioning is where it’s at when you’re on the mat.” Ross states, “Strength is important, but useless without the endurance to apply it.” Let’s examine endurance more closely and determine how we can attain superior endurance. As you can see, there are many types of endurance. Can you wrestle six minutes without huffing and puffing like a steam locomotive? Do you find yourself “gassed” easily? Can you shoot takedowns repeatedly in a match or is one powerful takedown all you have in you? Can you drill at high speeds for extended periods in practice? Can you execute moves quickly in competition? Are you still powerful in the closing moments of a match? First, let’s discuss the three energy systems. Energy for sports or any activity is derived from one or more of these systems. Wrestling, like many sports, involves a mix of the three systems. However, wrestling mainly uses the ATP-PC and Glycolytic systems. A wrestling match lasts at least six minutes but the activity is not done at a steady state. As mentioned before, wrestling involves many explosive bursts of activity within a six-minute match. Wrestling is primarily an anaerobic sport. Only about 10% of the energy used in a wrestling match is derived from the aerobic system. Anaerobic means “without air.” Let me repeat: wrestling is primarily an anaerobic sport. Now, let’s examine aerobic and anaerobic activity a little closer. As I have stated before, wrestling is primarily anaerobic. Therefore, you must not train like a marathoner or a cross-country skier. You need to train for the demands that the sport of wrestling require. Long runs are out. Lifting light weights for 10-15 reps for many sets is out (you are not a bodybuilder). Wrestling is not a marathon! Remember that if nothing else. I can remember wrestling in matches in which my legs felt like rubber toward the end. I couldn’t finish shots and had trouble defending takedowns. Lactic acid builds up in your muscles during exertion (e.g. an intense match) and causes fatigue. You need to condition your body to handle (buffer) lactic acid so you don’t fatigue as quickly. Interval training and circuit training are excellent ways to increase one’s lactate threshold. I hope that your coach has you run wind sprints. However, be sure to build up your intensity slowly. You may want to research lactic acid training for wrestlers online. I hope this article has given you some insight into the importance of endurance and staying power in a wrestling match. Now, get to work on your staying power!